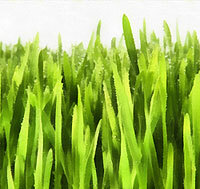 Posts about the pasture, including fencing, seeding, grasses, mowing/bush-hoggin, etc. Third in a series of posts about our efforts to reduce mud around our horse barn and in our pasture. In this post we reveal an inexpensive solution that seems to be working. It’s late fall and the green grass is now brown. Soon rain will come frequently and the temperature will drop. Fall has been in the air and my thoughts are turning to winter mud. I’m amazed at how much less mud there is in the summer because the longer, warmer days are more effective at drying and there is a lot more vegetation. But most of this has died off and we’re starting to face inches of the gooey mess. But not so much in front of our barn anymore. The least expensive of those was sand. We had some success with it back in 7/07, but that was a limited test. This time we went bigger. Beach or river sand isn’t very common here but something called manufactured sand is. It’s created by crushing limestone and looks like gray dirt. So we paid $175 to a local dump truck driver to dump 2.5 tons of manufactured sand at the entrance of our barn. This was before our tractor so we spent a weekend spreading this stuff around with shovels and a rake. Boy were we tired the next day! But it worked. That was about a year ago and despite a lot of rain throughout the four seasons since, the area where we spread this manufactured sand doesn’t clog up with water and doesn’t stick to shoes and hooves like the clay beyond it. This solution will only work for us in limited areas where there is high horse traffic. Now that the barn entrance area has less mud, we’ll next spread it on a path up the hill (to keep the tractor from making a muddy mess when driving up the hill) and around the round bale feeders. I’d like to try some of the other ideas above for the rest of the pasture, particularly the French drain or drain tile. 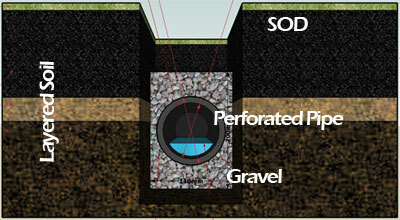 An example of a French drain is below and a drain tile system is similar, but less fancy (no gravel – just bury a perforated pipe in a trench and cover with soil). I’m not sure how well they’ll work with clay. This stuff is so non-porous, I think we could make cups and bowls out of it. The most obvious solution for the rest of the pasture is to plant grass. We’ve done this with a seed drill (more on this later) but since the entire pasture is open all of the time, the horses just walk all over it and eat the grass as soon as it sprouts up. What we need to do is create paddocks and practice rotation. 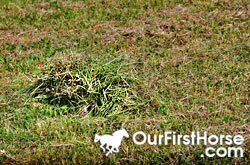 A portion of the pasture at a time would be off limits for a year or more while the grass grows roots and thickens. We could feed round bales of hay for a year or longer if needed. Even on our small property, the fencing could get expensive, though. We’re considering using Electrobraid or similar electrified flexible fence that could be installed less expensively than wood. We’ll let you know as we make more progress in our mud abatement effort. Please drop us a note if you’ve found something that works for you or if you have a question. I can’t believe it’s been 8 years since I wrote about this. A comment on the post reminded me that it’s time for a quick update. The application of manufactured sand to the barn entrance from the pasture did the trick alright. 8 years later and it’s mostly still in place. We’ve lost a little to erosion (we still need to install a drainage pipe. 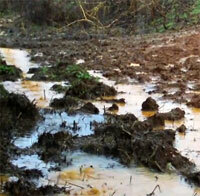 A small stream runs near this area when it rains hard) but it’s not the muddy mess we had when we started. The horses congregate here because the water trough is located nearby. Before and after manufactured sand addition, both shown on rainy days. Still a little muddy but much better! Barbed wire is bad for horses. Today we began replacing it. We’ve spoken of the dangers of barbed wire before. The biggest problem seems to be that horses get tangled in it when no one is looking and can end up seriously wounded. We know people whose horses have died this way. The property we’re on has a mix of wood fence and barbed wire and was probably used a long time ago for cattle. We plan to replace all of the barbed wire at some point but as you can imagine, the cost would be pretty high on a property this size (7+ acres of pasture). So for the visible areas, we’re continuing with a three board wooden fence, electrified as necessary on the top row. For the rest of the pasture, we’ll probably use something inexpensive but effective like Electrobraid. Since Pop and Granny moved in on property adjacent to the pasture, it made sense to replace this fence first. So we started by selecting a spot for a walk-through gate. Normally this would be in the shape of a V but we’re building a hybrid version in the shape of a U. Basically it’s wide enough for a human to slide through but not a horse. If built right, you don’t need to open and close anything because the horses won’t fit in. From here, we’ll replace a section at a time until all of the barbed wire between the two properties is gone. Today was nice and mostly warm, in the upper 60s and dry so there were no concerns about the concrete we’re using on our fence posts setting and drying. We used an auger (post hole digger for a tractor) on the Kubota that saved us a lot of work. Augers don’t seem to work well in clay soil so what might take a minute or two in Missouri takes twenty or more minutes in east Tennessee. But it beats digging by hand! Taking the advice of someone who build a lot of fences, we covered the part of the pressure treated 4x4s we used as fence posts in roofing tar paper in an attempt to keep moisture and dirt away from the wood. It’s cheap and easy to do and we’re hoping it will add life to the posts. As with any project, especially one where learning is involved, it’s taking longer than we expected but we’re getting better at it with each post we stick in the ground. By the time we’re done, we’ll be fence installation experts! I’ll show before and after pictures in an upcoming post. I guess I should have expected it because it seems just about every year our vacation is interrupted by a phone call from a concerned neighbor about our horses roaming the streets. This one was no exception. We were 400 miles away in Savannah, GA and the phone rings. Luckily our backup system worked this time. The last time this happened, all of our horse contacts were away also. 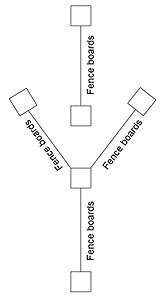 Now you might think that our fence is pretty crappy after reading our posts about fence breaches but in truth it’s a good fence, a mixture of a three board wood fence (double boarded on the top layer) with barbed wire. The barbed wire isn’t horse-friendly so we’re replacing it over time but normally it works to keep animals inside pasture and is very common where we live in east Tennessee. The first break was just Romeo, our small Appaloosa. A neighbor called to inform us he was down the road in an open pasture by himself. A horse friend led him home and Mikki’s dad patched where we thought he got out. Romeo is a barrel horse, flexy and nimble. There was one strand of barbed wire that was spread a little far so he patched it up very well. The next day, another call comes in telling us that Romeo is walking down the highway between two open pastures. Ack! After being led to the barn, a quick check revealed the previous patch job was still intact but a more thorough perimeter sweep identified that a tree had fallen way out back in a place that was difficult for humans to detect. Romeo simply stepped over the fence and went on his merry way. Why the other 3 horses didn’t follow, we don’t know. Mikki’s dad got a crash course in barbed wire fence repair with the help of a horse friend and everything was fine. Until tonight. We waited a little late to feed the horses tonight. As I looked up at the fence next to the barn, I stopped in my tracks as I saw the carnage. Fence was everywhere. With my flashlight, I pointed in the direction I thought the horses would have gone and saw lots of shiny eyes reflecting the light. They were eating grass from my neighbor’s lush green lawn. It wasn’t hard to get them to return to the barn since it was feeding time but darn if they didn’t have to spend a few of the hottest days this summer in the barn while we bought wood and planned our next move. The next day I was able to see what they had done and get a picture. Two 4×4 posts were snapped as well as some of the fence boards. This is the area we call the peninsula and it’s a problem spot in our pasture. Our horses congregate here and when a fight breaks out, there aren’t many options for escape. I think this is likely what happened versus the horses leaning against the fence for greener grass. This break seems like it was pretty violent. We’ve decided to move the fence to eliminate this peninsula and to make way for our manure composting system. This is now much higher on our priority list. By the way, it’s a good idea to always have some emergency repair supplies around. These kinds of things almost always happen to us at night or on a Sunday when the lumber yards are closed. Fly Masks – we use fly masks (our current favorite is the Farnam SuperMask II) because they have an immediate impact. I noticed flies on my horses’ eyes and was immediately able to rectify the problem. The first time we ever used a fly mask, our horses didn’t particularly like the velcro ripping sound but eventually got used to it and give us no trouble at all putting them on in the morning or removing them in the evening. Yes, that’s right, you need to put them on and take them off daily. Although the masks have the added benefit of cutting down on light (kinda like horsey sunglasses! ), this obviously isn’t a good thing at night. And even though the screen of the masks make it look like horses wouldn’t be able to see out of them, I’ve actually strapped one on and driven down our street to prove a point. You can see fine through the screen mesh, as long as it’s day. Cost is $15-$20 each but they last a long time if you take care of them. Feed-through fly control – I was initially concerned with feeding insecticide to my horses but it’s a very small dose for them and has proven effective and safe in horses and cows for many years. Feed-through fly control works well because it keeps the flies from hatching in manure. You won’t notice the benefit for weeks but this method works very well if you stick with it all summer. Some feed stores sell it in 2 pound tubs and higher, some feed stores actually sell it in bulk so you can buy a small bag for less than $10. I’d recommend sticking with a well known brand, though and do some research before selecting which brand you’re going to trust. Equi-Spot on-horse – Equispot is applied directly to the body of your horse, mostly down their spine and on their legs. It’s effective for a couple of weeks at repelling and killing “house, stable, face and horse flies, plus eye gnats and ticks on horses”. This is the only method we use to treat against ticks, so it’s pretty important. It needs to be applied every 2 weeks or so but the benefits are worth it and it takes affect immediately. Oh and it has a nice citronella smell and is water resistant. The price is around $11 for a package of three applicators (one applicator per horse, per application). Sometimes Jeffers has a deal where you get one free if you buy 3 or 4 packages. Liquid fly traps – I saw these at my local country hardware store one day and decided to give them a try. These are clear plastic bowls with a funnel underneath that the flies use to enter the trap. They’re attracted by fly stink bait (trust me on this – WEAR GLOVES to mix it. The smell stays on you for days otherwise.) and can’t escape, eventually drowning. These are cheap (around $5 each) and easy to setup. You open up the stink bait, add water, swirl it around a little, turn it upside down and hang it somewhere. In weeks you’ll have a disgusting pool of dead flies. It’s gross but it works. Since it uses a fly attractant, don’t hang in the barn. Mr. Sticky Roll Fly tape – I saw this at Tractor Supply one day and had to try it. It’s a new take on the idea of fly tape. Instead of those cylinders handing from the ceiling with yellow tape on them, the Mr. Stick fly tape is more of a thick string on a set of rollers you can string above your stalls. The tape is long – 81 feet. Flies are attracted to it, stick and die. When the tape is full, you turn the roller to reveal more. Much faster than the old fashioned fly tape and the price is low. Less than $10 for 81 feet. Fly spray (as needed) – Our horses HATE this stuff but probably because it comes in a spray bottle. It’s not very water resistant and needs re-applying often. But where fly spray makes sense is for as-needed situations, such as around (not on) a healing wound or on the legs. To minimize the spray bottle effect, we spray onto a cloth and them rub the cloth on the horses. This works especially well on their faces. This stuff is pretty expensive, running $10-$25 per bottle, so we use it sparingly. Fly parasites – Fly parasites (really gnat-sized parasitic wasps) remind me of alien science fiction movies where the alien hatches from it’s prey. That’s pretty much how it works with fly predators, too. And gross as that may be, these have been effective at fly treatment for us for years now. You subscribe to receive regular shipments throughout the fly season and every 3-4 weeks a shipment comes in a padded yellow envelop. You have a few days before the parasites hatch. Once they begin hatching (they look like little gnats), you spread them around where flies are likely to be, such as a manure pile. And although I at first was concerned with introducing a parasite near my horses, they are only interested in pillaging the flies. Price is around $15-$20 per shipment. Aerated manure composting – I’ve been talking about this for a while now but ultimately we need to do something about our manure. That’s what seems to attract flies the most and we have plenty of it. Of course you should endeavor to keep manure away from the barn as much as possible but the reality is, this isn’t always possible. We’ve been looking into aerated composting as a way to not only deal with the fly problem but also to ensure that manure is fully composted, killing weed seeds and harmful bacteria before we spread it in the pasture. Composting is a pain, normally, but aerated composting uses perforated pipe, a fan and timer to inject oxygen into the manure pile periodically, stimulating bacterial breakdown. It’s said you can convert manure to safe compost in 30 days using this method, without manually turning the pile. We haven’t done it yet but we’ve scoped out a location and made some napkin drawings of what it would look like. Cost is around $1,000-$2,000 so we’ve been putting it off. There are a few companies selling aerated composting systems and we’re hoping to doing a review in an upcoming series of posts. Chickens – We were given some chickens last year and have enjoyed almost everything about having them. One bonus is that chickens seem to love eating fly larvae, so I have to include them in our fly management routine. They need very little care, don’t smell (unless you have a lot of them) and skip the rooster and you won’t have to worry about baby chickens. The eggs are great, too. The biggest problems we have with chickens are what to do with all of the eggs (one per hen per day most of the year) and since we free-range our chickens, predators. We’ve been pretty lucky so far but there is little we could do to save them if a wandering dog went into to predator mode. As with anything relating to chemicals and your horses, make sure you do research before pursuing any of the insecticide options in particular. Some don’t mix well with others and your safety and your horse’s safety should be the first concern. So that’s what we do to handle the annual fly problem. Are you doing anything different? 05-20-2010 Update: added chickens to the list! Is your pasture wet and muddy too? When it rains, it pours here in East Tennessee. To make winters even less pleasant, the frequent rain (January is our second rainiest month) is causing us work and making the lives of our horses a little less fun. Even though it was warm Sunday when I shot this little video, I decided to let the horses in to dry off and they seemed to appreciate it. I can’t wait until we have a few dry days to move some dirt. We knew we had some new drainage issues but the big rain storm Sunday made it seem a lot worse. I made this quick 2 minute, 26 second video to show you how muddy our place is right now. Now with voice overs! LOL. Once you get past the first few dizzy seconds, the rest of the video is pretty smooth. 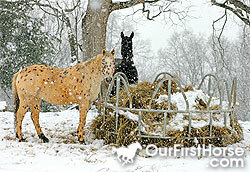 So does your barn and pasture look like this right now, too? Have you seen this horse fence commercial? Unlike regular TV, I usually don’t fast-forward the commercials when I watch horse shows on RFD-TV . If something relates to or interests me, I’m happy to watch. Horse products interest me. One of those commercials showed a truck driving towards a fence and at the last minute the driver jumped out while the truck headed towards the fence. They had my attention. The fence flexed under the force of the low speed impact and appeared to repel the truck before returning to its previous shape. I know nothing about the horse fence manufacturer Centaur HTP, but that TV commercial really impressed me. If the price is reasonable and I find some good feedback on the Internet, I’ll consider their product. Have you heard anything about Centaur HTP fencing?